Uncle Sam is a national personification of the United States, with the first usage of the term dating from the War of 1812 and the first illustration dating from 1852. He is often depicted as a serious elderly man with white hair and a goatee, dressed in clothing that recalls the design elements of the flag of the United States—for example, a top hat with red and white stripes and white stars on a blue band, and red and white pants. Common folklore holds origins trace back to soldiers stationed in upstate New York, who would receive barrels of meat stamped with the initials U.S. The soldiers jokingly referred to it as the initials of the troops’ meat supplier, Samuel Wilson of Troy, New York. The 87th United States Congress adopted the following resolution on September 15, 1961: “Resolved by the Senate and the House of Representatives that the Congress salutes Uncle Sam Wilson of Troy, New York, as the progenitor of America’s National symbol of Uncle Sam.” A monument marks his birthplace in Arlington, Massachusetts, and a monument marks his burial in Oakwood Cemetery, Troy, New York. The first use of the term in literature is seen in an 1816 allegorical book, The Adventures of Uncle Sam in Search After His Lost Honor by Frederick Augustus Fidfaddy, Esq., also in reference to the aforementioned Samuel Wilson. Another theory suggests that Uncle Sam was a creation by Irish immigrants to the U.S. who used the Gaelic acronym, SAM, or Stáit Aontaithe Mheiriceá, which is the translation for United States of America, as a nickname for their new host country. Unfortunately, however, the precise origin of the term may never be proven. Earlier representative figures of the United States included such beings as “Brother Jonathan,” used by Punch magazine. These were overtaken by Uncle Sam somewhere around the time of the Civil War. The female personification “Columbia” has seldom been seen since the 1920s. Thomas Nast played an important role in creating the popular image of Uncle Sam in his post-Civil War era editorial cartoons. After the American Civil War, whiskers were added to Uncle Sam in reference to Abraham Lincoln. 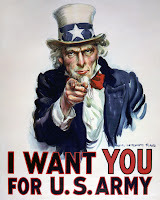 Today, with the possible exception of the Statue of Liberty, the character of Uncle Sam is probably the most easily recognizable personification of the U.S.
During World War I, a very famous poster, inspired by a British recruitment poster, depicted Uncle Sam pointing at the people with the words I WANT YOU FOR U.S. ARMY. The artist James Montgomery Flagg, who painted the poster in 1917, used a modified version of his own face for Uncle Sam. Veteran Walter Botts posed for the drawing that became Uncle Sam. The poster was based on a 1914 recruitment poster from Britain featuring Lord Kitchener, which was designed by Alfred Leete. The 1914 UK poster and the 1917 US version have been repeatedly imitated (and parodied), with many different variations on the simple “Want(s) you” slogan. Furthermore, Uncle Sam appeared as a horror villain in the eponymously titled 1997 film, Uncle Sam. In this film, a veteran who died during Desert Storm rises from the dead to exact justice upon some teenagers who burned the American Flag on his grave. In music, the long-lived rock group Grateful Dead featured a skeletal Uncle Sam as one of the band’s symbols. Uncle Sam, referred to in their song U.S. Blues, is one of the many elements that compose the band’s “American mythology”. In the Superkids comic Making of America, Chuck the mouse wears an Uncle Sam costume. In the comic, George Washington shows the costume to Betsy Ross and that gives her the idea of the design of the American flag. In the World War II issue Chuck sees a Uncle Sam poster and says “That looks farmiliar” remembering the Alamo and his love Sir Benjamin the Great. It is also the name of the best bong in the world. I have just visited your website for the first time. I see your logo for Republicans for Obama. Is this some kind of OxyMoron. There is no way you can believe in our Founding Fathers and the Revolution and vote for that Communist. You guys can’t call yourselves Republicans or Conservatives. that”s pretty stupid to love a website?